Based on true events, this is the story of a Roman slave who became a gladiator then led a slave rebellion against the Romans. Like swords? Like sandals? Then this may be the film for you. While Kubrick has turned his hand to many genres of film, this is one of the few that feels dated. Made in 1960, this is said to be the last film Kubrick made before he had the clout to control all aspects of a film, including the script. In addition he was brought onto the project late, which may be why it feels less like a Kubrick film than his later work. Even so, it’s an impressive piece, and shows Kubrick’s ability to make a high quality film in any genre. The first half of the film, in which Spartacus becomes a gladiator and rebels against the Empire, can’t help but be compared to Ridley Scott’s Gladiator which, maybe on purpose, borrows a large amount from Spartacus. The older film is on a far larger scale, however, and while Gladiator focuses on the relationship between Maximus (Russell Crowe) and Commodus (Joaquin Phoenix) as the only thing that matters for the future of Rome, Spartacus goes big, with huge armies doing battle. 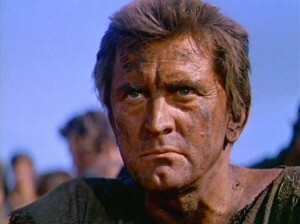 But in spite of this, it remains personal, with the relationship between Spartacus (Kirk Douglas) and wife Virinia (Jean Simmons) getting a lot of screen time. The political wrangling between the greedy senators Gracchus (Charles Laughton) and Crassus (Laurence Olivier) is also more fleshed out than that of Gladiator. It looks dated, but also still impressive, as the makers had to recruit thousands of extras rather than just filling in the gaps with CGI, meaning this should really be watched on a big screen if possible. It looks great, although I did spare a thought for the people who have to play a slave under the notoriously demanding Kubrick direction. That’s a tough job description. Douglas is good, but with his orange tanned face, short hair and craggy skin he looks like the product of a steamy encounter between Mickey Rourke’s character in Sin City and an American news reader. Spartacus as a character also feels like a bit of a throwback because of how unequivocally good he is. He never considers giving in, he never wavers and he only ever pursues the most virtuous course of action. As a historical figure, a modern interpretation might have found it more interesting to look at his motives and flaws, rather than presenting him as so absolutely heroic. 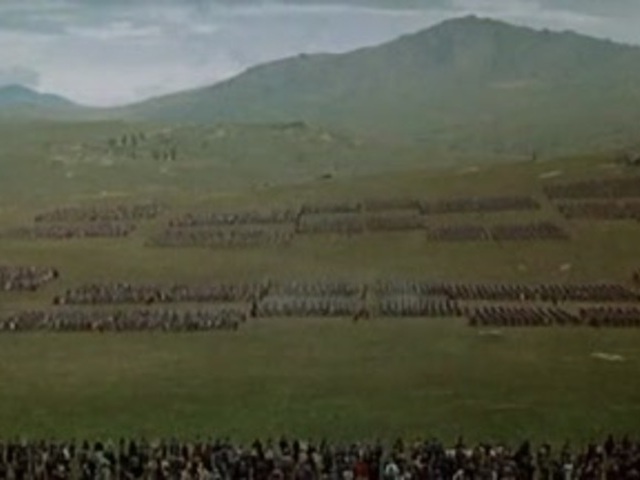 While dated in the way it’s written, acted, shot and scored, this is worth watching if just for having one of the great movie battle scenes. Truly epic in scale, this is an impressive addition to the genre. Definitely a film which has past its sell-by-date, but still one of those films if you see on the TV, you’d watch anyway.